with +50 CBG Plants installed throughout India. Atmos Power is the market specialist in the Biogas purification process and manufacturing of Biogas purification plants. Due to our constant research and development, Atmos Power is the only company in India that provides MPSA technology using its very own proprietary energizer. We provide complete solutions for Biogas purification into Bio-CNG along with Bottling services. We manufacture custom built gas plants based on the needs and requirements of its customers. Atmos Power follows the ISO coding system for all its design and manufacturing processes. The large variety of gas plants offered by Atmos Power includes: Biogas Purification & Bottling Plant. Bio-Methane is the cheapest, cleanest and least environmentally impacting alternative fuel. Vehicles Powered by Biomethane produce less carbon monoxide and hydrocarbon emissions. Biomethane helps improve living standards in rural areas. India imports most of its CNG from the middle eastern countries, which puts a lot of pressure on the trade balance of our country. There is enough amount of organic waste for installing more than 100,000 Biogas Plants in India. Bio-CNG has a high octane rating and high thermal efficiency. Biomethanation helps reduce global warming as methane is captured and consumed. Using Biogas in villages helps in the preservation of forests, which are cut down for firewood. After learning about the recent success of Amul Dairy’s Biogas plant, we decided to set up our own biogas purification plant. The biogas generated through Biomethanation was earlier treated as a waste product and a nuisance. However, with the help of AtmosPower biogas purification plant, we are able to utilize the gas as fuel in our boilers. We recommend AtmosPower’s Biomethanation and Biogas Purification plant to all dairies throughout India. In 2015, we set up one of India’s largest Biogas Plants with a capacity of processing 400 tons of waste daily. It was a monumental task, which was achieved with the help of the Pune government and the strong effort spearheaded by our team. We are currently producing BioCNG from the waste and supplying it to our gas station, which sells the Bio-CNG under our own brand name. We are thankful to have worked with AtmosPower who provided us with the much needed technical support for executing this mammoth task. We are glad to have been associated with AtmosPower in the process of setting up our own Biogas Plant. Biogas production for the creation of CNG was a completely unknown concept to us and we are glad to have discovered it. The process of Bio methanation, and eventual biogas purification provides us with 3 benefits. The first being a cleaner environment, the second being energy independence and the third being natural - chemical free - fertilizer. After learning about the ease with which one can set up a Biogas Plant in India, our company decided to immediately take advantage of this by collecting food waste from the nearby community and starting our own Biogas Plant. After learning about AtmosPower’s expertise and credibility in the Biogas field we decided to work with them for this project. It was a good decision and we are pleased with the service and support offered by AtmosPower in setting up our Biogas plant. We are also very proud to say that we are helping in improving our country’s air quality and environment. We are using 5 tonnes of cattle dung collected every day to produce green fuel in the form of BioCNG. We are thankful to AtmosPower for helping us set up our very own Biogas Plant using waste that was earlier not being utilized effectively. We are producing completely natural, liquid and solid fertilizer along with BioCNG. Our Biogas Plant is usually running at full load, due to the high demand for the BioCNG and fertilizer in the nearby Region. At Bharat Biogas we aim to produce fuel that is Eco-Friendly and fertilizer that is chemical free. Our Biogas Plant is one of the biggest in the country with a capacity of generating up to 2000 Units of Electricity per hour. The purified gas is also being served to nearby hotels, restaurants and schools as a replacement for their LPG requirement. We are thankful to AtmosPower for providing us with their indigenous Biogas Technology that is allowing us to preserve our environment for a better future. We installed the first Biogas to BioCNG Plant in Bhutan with the help of AtmosPower’s Biogas Technology. Earlier the city waste was being segregated, however, the segregated organic waste wasn’t being used efficiently. By installing a Biogas Plant and converting the Biogas to BioCNG we could provide Bhutan with its very own green Fuel. If we continue to install such Biogas Plants, Bhutan’s dependence on imported LPG can significantly be reduced and it’s financial reserves preserved. By cleaning and compressing the Biogas generated from our Dairy ETP plant, AtmosPower’s Biogas Plant has helped us reduce our methane emissions in addition to providing us with a clean alternative fuel for powering our boilers. The excess gas available after captive consumption is bottled and sent to our second site where it is used as a replacement for commercially bought CNG. We are glad that we are now making the best use of our Biogas Plant to benefit the environment and our company. We are happy to recommend this technology to all dairies throughout India. We have successfully been generating Bio-CNG through the biogas plant installed by AtmosPower at our facility. The Biogas plant is equipped with a biogas purification system that allows biogas cleaning and bottling for commercial sale. The plant was commissioned in 2013 and it has been serving us well thereafter. We are extremely thankful to Atmospower for providing us with very good service and support. The bottled biogas is helping us serve the needs of the nearby hotels and restaurants. Atmospower has installed a Biogas Plant with a facility for biogas purification and bottling. We are extremely satisfied with the performance of Atmospower as it has considered all our needs while designing the biogas plant. We have received great after sales service and all our queries are met promptly. The Biogas Plant provided us with the most cost effective solution for Biogas Purification. The Biogas cleaning process is carried out constantly throughout the day, and we are proud to own one of the few successful biogas purification plants in India. AtmosPower’s team gave us the best guidance and provided us with a high quality Biogas Purification and biogas bottling Plant. We greatly appreciate the technical input and data they provided as per our requirements. We were a little uncertain at first because we had not heard about any successful Biogas Plant in India. However, after having many discussions with AtmosPower’s technical team, we were convinced to install our own Biogas Plant. We are glad to say that our decision proved to be fruitful and we are now generating our biogas and natural fertilizer for commercial sale. Selling the cleaned Biogas in the commercial market is lucrative as it easily replaces all LPG applications. Atmospower provided us with a Biogas Purification and Bottling Plant using their proprietary M.P.S.A technology. We had to comment that we are extremely pleased by the product that we have received and all the services along with it. AtmosPower provided us with all the details from foundation to commissioning and our Biogas plant has been running successfully since 2012 without any problems. The natural fertilize produces as a by-product is also serving as our main source of revenue. 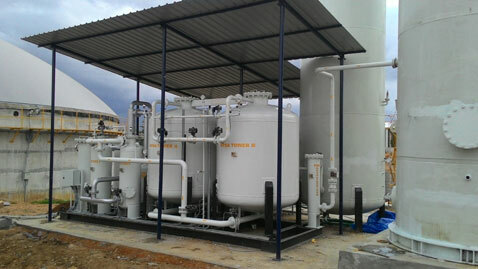 AtmosPower is India’s Leading Biogas Purification (Upgradation) Plant manufacturer. We provide everything you need from the most cost effective equipment to expert consulting and training in order to set up your very own Biogas Upgradation plant. The term purification is used interchangeably with the term Upgradation in the Indian market. We at AtmosPower understand the importance of all the stages of the upgrading process, which is why we focus on every stage starting from Raw Biogas collection, Biogas cleaning, Biogas drying, Biogas purification, Biogas compression and finally Biogas Bottling. AtmosPower is recognized as the most successful Biogas Purification Plant manufacturer with more than 30 Biogas Bottling Plants in India. We offer consulting, inspection, testing, erection & commissioning of the entire Biogas Upgradation system at your Biogas producing site. All of AtmosPower’s Biogas Upgrading systems are custom built based on the precise upgrading requirements provided by our clients, with flow rates ranging from 20Nm3/hour to 2000Nm3/hour. The purity of the biogas can also be tweaked based on the end use of the Biomethane, thus ensuring that our clients get the exact product that they desire. There are different types of Biogas Upgradation Systems based on vacuum pressure swing adsorption (VPSA) technology. After a decade of research and development, AtmosPower has successfully managed to engineer a medium pressure swing adsorption technology to reduce the energy requirement of its Biogas Purification systems. AtmosPower is the pioneer and sole provider of biogas purification plants based on its medium pressure swing adsorption (MPSA) technology. The Biogas Upgrading System is extremely efficient in acting as your very own biogas to Biomethane conversion plant. Our pricing structures are highly competitive to ensure our client’s satisfaction with both cost and quality. We provide excellent customer support services for running your Biogas purification plant at optimal efficiency. We continue to successfully install and run many of our Biogas Purification systems and biogas bottling plants in India, with satisfied customers to vouch for our credibility. With our years of experience and expertise, AtmosPower has carved a niche for itself and become a formidable player in the biogas purification and biogas bottling process. You are in trusted hands at Atmos Power as far as your biogas purification and bottling needs go. Our technology will transform your old biogas plant by upgrading the biogas to Bio-CNG (Biomethane) with ready takers in the market. The level of purification achieved using our systems allows you to almost interchangeably use the term CNG for your product. The Bio-CNG produced using our Biogas purification systems can also be used in place of traditional LPG. With purification clients all over India, our upgrading process has proven its efficiency multiple times. We enable you to market the much sought after fuel of the future – Bio-CNG, by installing high quality Biogas Plants In India.